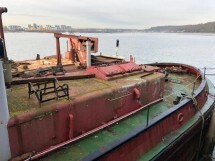 Full Description: Premier Houseboats are pleased to present Humber mariner, an ex tanker barge now on a secure residential mooring and ready to convert to a large, character home. 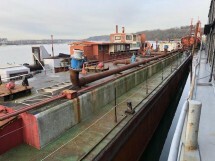 Built by the Yorkshire Dry Dock Co in 1963, this boat has 6 tanks of 70 cubic metres each, which can be opened up to create an incredible living space, and also has the ability to create further living space on deck. 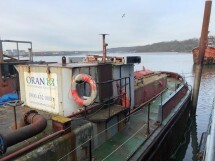 There is a Gardner 8L3B engine, which although it has not run for a number of years, could be brought back to working order. This is an opportunity to create a good sized family home, whilst still keeping the look of a boat, and is priced extremely competitively. 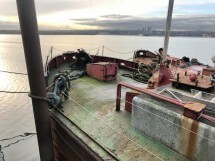 Vessel name: Humber Mariner Vessel condition: Good Year constructed: 1963 No. of engines: 1 Engine model: Gardner 8l3b Fuel type: Diesel Length over all: 140' Beam: 17' 6" Maximum draft: 4' Hull material: Steel Hull type: Flat Disclaimer Premier Houseboats offers the details of this advert in good faith as it was presented by the seller or his representative but cannot guarantee or warrant the accuracy of this information nor warrant the condition of the described item within this advert. A buyer should instruct his agents, or his surveyors, to investigate such details as the buyer desires validated. The Item described within this advert is offered subject to prior sale, price change, or withdrawal without notice.